The problem is that most affiliates are lazy and if you dont provide them instant promotion tools then they will go to the next vendor and wont even check your product. Also many of affiliates are just newbies that wont know how to use the standard affiliate link Clcikbank provide them for your product. With Clickbank Promo Tools Generator you can now create your dynamic affiliates promotion tools page in less than 2 minutes. And, if that were not enough, if you purchase right now, Im going to give you Master Resell Rights to this hot product, which will allow you to promote and sell this software to your friends, customers, email list or other Clickbank vendors and keep 100% of the profits from those sales deposited directly into your PayPal account. Think about this, for a measly $37.00 $17.00 today you can be on your way to having your very own high traffic affiliate website. This is a small sum to pay, to start finally taking steps towards getting your affiliates start to work for you and motivate them to sell your products. 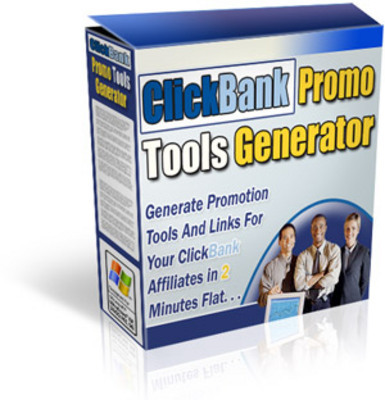 CBPromo Tools Generator cbproducts;cbpromo;clickbank 90167626 12.00 sinjatin Fresh Download Available!